"My Life Has Been Ruined by an Anti-Baldness Drug"
It obviously doesn't affect everyone but it is a one of the many risks you take if you use Finasteride. VICE -"I Need to Quit Hair Loss Drugs Before They Kill Me"
It's not conspiratorial most GPs in Europe refuse to prescribe Propecia/Finasteride for hair loss. You will find that the only Doctors who say Propecia is "safe" have a vested interest in prescribing the drug. I developed severe insomnia while on the drug along with other non sexual side effects. You may be fine now but try stopping the drug for a few weeks. 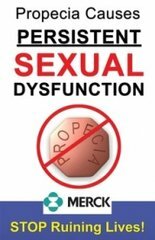 I had no sexual side effects until after I came off Finasteride. Then my hormones crashed and my Libido was wipped out over night. You be should be glad you still have your health. I'd give anything to turn back the clock and to have never taking Finasteride. Good luck with trying to sue Merck you will most likely die of old age before the trials come to court. This is probably why most of the law firms are pulling out of the propecia class action law suits. Plus even if you win you will get very little money. Letting people know the truth about Finasteride is not propaganda its informed choice, something I didn't get. France 2 news report on Finasteride causing "Suicidal Ideation". How common is Post Finasteride syndrome? Probably because Aspirin can't destroy your mental physical and sexual health. IMO its most likely because PFS has a much bigger impact when it hits men in their prime. One possible explanation is that Finasteride may cause an autoimmune reaction in some poeple in which the body attacks its self. I know when I came off Finasteride I lost a massive amount of weight in a very short period of time.